Four years ago Katie and I found ourselves at a major crossroads. The last year was just about getting through. Making it work. Being numb. Spring was coming quick. Decisions had to be made on the farm…and fast. We sat up many nights, on our back porch, talking. Brainstorming. Dreaming. Tim was the one who knew EVERYTHING about farming. Sure, we had been helping for over 10 years. 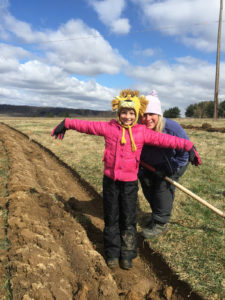 We had started Sweet Meadows and helped grow the farm to what it was. But neither of us knew anything about corn. Or soybeans. Soil biology, mycorrhizal fungi, compost tea…that was all HIS thing…and he was GREAT at it. So we started reading. We went to the OEFFA conference and soaked up all that we could. We joined Facebook groups about pastured pigs, and permaculture and regenerative agriculture. We got excited! It was time to finally make the farm ours. We met a lot of great people and in the early early spring of 2015 we started. We carved up a pasture field into berms and swales. We planted 400 fruit trees. We decided to stop putting row crops on our farm and it felt good. One night during one of our camp fire talks we realized OUR farm had no name. Tim had always operated under Kimpel Farms. Sweet Meadows was our grocery store. What to call OUR FARM? We were going to be moving onto the farm in the passive solar home that Tim built and Katie grew up in. 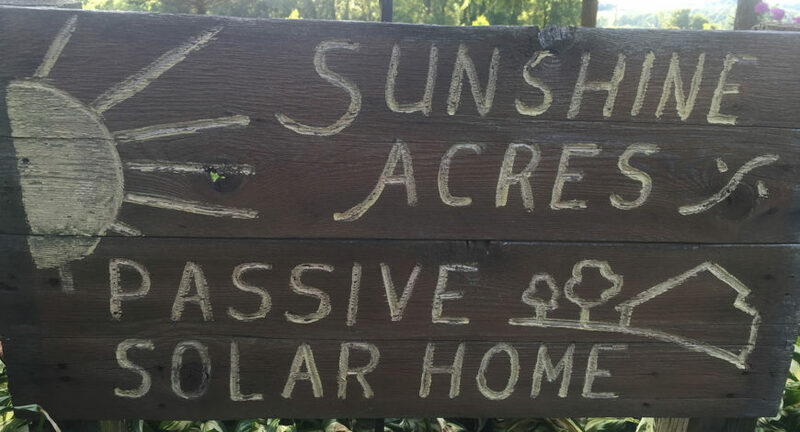 The sign in the flower bed said: “Sunshine Acres”. There was an idea. But it seemed…kinda cheesy…and not mine. So we brainstormed. And tossed ideas around. But nothing stuck. Then one day I was reading Restoration Agriculture by Mark Shepard. This line stuck out to me: “Remember a farmer is, after all, in the business of collecting solar energy.” Wow! I really liked that. I asked Katie what her dad used to call her as a kid, half remembering…just confirming…and she said “Sunshine”. 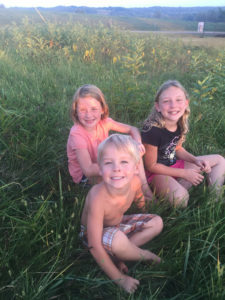 As I sit here, watching the evening rays filter through the golden blond hair of my three kids, Sunshine Acres feels right. It feels like ours. And it FEELS GOOD.